John Tortorella is back. He’s coaching again and his first foray back behind the bench will be in November in the “Deutschland Cup”. But that’s just the appetizer. “He eagerly accepted this,” said Jim Johannson, the executive directory of USA Hockey. Tortorella has a long standing history as a successful Stanley Cup winning coach in the NHL and a history in USA hockey that includes a silver medal. Right now he’s not currently coaching so this interested president and GM of the 2016 U.S. World Cup of hockey team, Dean Lombardi, in more than one way. 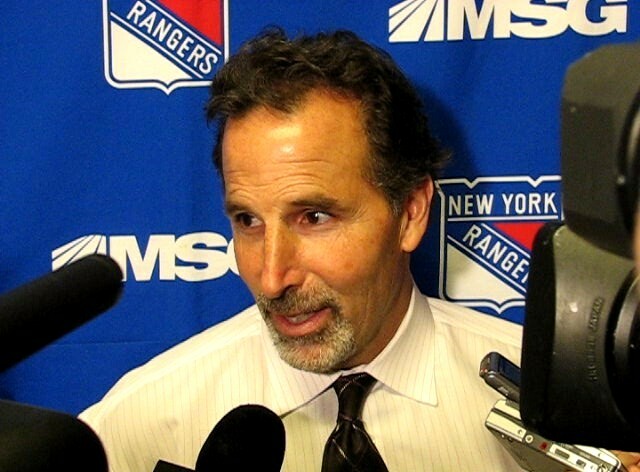 Tortorella, has been a smart, fiery coach. Sometimes he verbally sparred with opposing coaches, sometimes with his own players and sometimes with the media. Lombardi is aware of that and knows why. Tortorella, was open and honest at today’s press conference. He didn’t mince words but he did choose them carefully. In a short tournament that may benefit his team because you can be eliminated before you figure out the opposition. Time isn’t on your side. “I’m so honored and so excited about the opportunity,” Tortorella added. “I listened to Dean talk at Lake Placid. It resonated with me. The Massachusetts-born coach is the winningest American coach in NHL history. He knows he’ll have to put certain players into roles they aren’t accustomed to in order to win. He can be very persuasive and it’s one of his strengths. Back to Lombardi, he’s also Massachusetts-born and he found out recently that he and the coach have more than that in common. “We’re both Italians. I traced his lineage on ancestry.com,” he laughed. The 2016 World Cup of Hockey will start next September in Toronto, Canada. For now the new Team USA coach will be an analyst on the NHL Network as he gets ready for his coaching stints. “I’ve tried to figure out the analytics. The good and bad one’s in our game,” Tortorella added. This tournament should be a fun one. It seems like a long time away but some of the hard work has already begun.